My mediums are transparent watercolor, mixed water mediums (watercolor, acrylic, inks, collage, gesso) and digital painting. I have been working as a professional artist for most of my adult life, and have also taught watercolor, most recently at The Drawing Studio in Tucson. I completed my BFA (Studio Art) and then my MA (Art Education) at the University of Arizona, Tucson, where my husband and I have lived for the past 40 plus years. I have earned juried signature status in the National Watercolor Society, the Western Federation of Watercolor Societies, Watercolor West and the Arizona Watercolor Association. 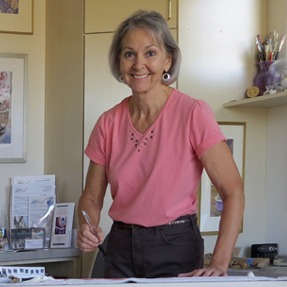 I am also a signature/honorary member and past president of the Southern Arizona Watercolor Guild. My work has been given awards in local, regional and national competitive watercolor exhibitions, and featured in magazine articles and books about watercolor. I have produced a 5-volume series of watercolor instructional videos for the beginning watercolor painter, as well as watercolor workbooks on various aspects of watercolor painting. ​If you're in the Tucson area and you'd like a studio visit, please call 520-743-7841 or contact me by choosing the email link button below.